Just when you thought real samurai are long gone, we have great news for you. 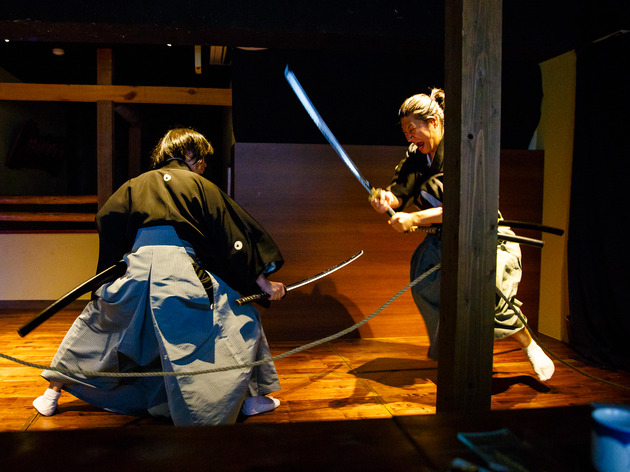 You can now watch a show of fighting warriors at the recently opened Tsukune Samurai Sananoue, an izakaya that’s nestled in the back streets of Shibuya’s Maruyamacho district. Back in the Taisho period to the early Showa period, Maruyamacho was a thriving geisha district with plenty of kimono shops and ryotei (luxurious traditional Japanese restaurants). So it’s not surprising that there’s an active geisha house right next to the izakaya. With Tsukune Samurai Sananoue, project manager Hidenao Kuboki seeks to combine Japanese cuisine with theatre and workshops, in hopes of preserving the traditional arts. The samurai performance, which takes you through the history and culture of samurai, is particularly engaging because one of the performers, Masakumo Kuwami, is actually the tenth grandmaster of ancient martial art tenshinryu. He will be showing off his skills along with his two assistant instructors during this authentic samurai show at the premises’ second floor space. Tenshinryu was developed about 400 years ago by Munenori Yagyu as a military strategy to protect the Tokugawa clan, the family which established the Edo shogunate. It’s immediately obvious that this is not a mere act, as the performers are serious in demonstrating this ancient martial art, especially during the final few fight scenes. From the moment they appear on stage dressed in the traditional samurai attire of hakama (formal divided skirt) with double swords by their sides, there’s a certain regality in the way they move that makes this an engaging yet eye-opening show. Don’t miss the workshops as this is the time for you to learn the way of a samurai. Learn how to draw a katana sword, throw some shuriken (stick or star-shaped throwing blades), or master the appreciation (aka the cleaning process) of a katana. These actions are not as easy as they sound, especially the shuriken, which takes a lot of precision and skill to make the blade stick to the board. The 90-minute show and workshop is a unique experience, giving you a rare glimpse into the ancient, mythical culture of the samurai. Moreover, prior knowledge of Japanese history is not necessary, since everything is conducted in English. If you can’t make it to the actual show (every Sunday noon), you still have the chance to meet one of the warriors several times a week at the izakaya, who holds solo performances around 8pm. 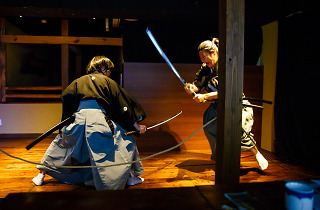 For more information on Tsukune Samurai Sananoue and its samurai shows, click here.